It’s a Beautiful Life – if we want it to be! Home » Featured » It’s a Beautiful Life – if we want it to be! Christmas time is right around the corner and for most of us it will be a time for family, friends and neighbours. There will be people rushing around, buying last minute gifts, baking those cookies that are always a special Christmas treat and the anticipation of giving and receiving gifts from our loved ones. Christmas is also a time of emotional ups and downs, with many people suffering heightened bouts of depression, anxiety, feelings of loss and disappointment. While most of us are prepared to celebrate the holiday, and the ensuing emotional ups and downs, sometimes whether we like it or not, our brains sometimes will have other plans for us. Did you know that Christmas is probably the one holiday where most people feel alone, unloved and unwanted? When others are getting together with family and friends, others, with dysfuntional families are dreading the possible outcome of these get togethers. They maybe grieving, that what is portrayed by the media, has never happened in their families. Then there is the added misery of those who are affected by the lack of sunshine and daylight hours. Commonly this is known as Seasonal Affected Disease or SAD. While this type of depression will lift once the day light hours start to increase again, the time in between can be excruciating for those who suffer from this malady. How do we learn to cope with these emotions and the rollercoaster ride that they can cause in us and others around us? First and foremost, I think we need help in identifying what it is that has us “bugged”. Recognise the triggers that set us off and then be ready with some coping skills, so that we can get through this harrowing ride and be smiling at the end of it. We don’t want anyone to end up a statistic over the holiday season. If you are suffering from SAD, there is help. If the lack of sunshine is causing you a bad case of depression, light therapy could lift your mood and no drugs are required to get you on a happier footing. There are many different lights available that you can literally sit under, read a book and increase the hours of light that your body is experiencing. Researchers have found that as little as 30 minutes in the morning under high intensity lights can help to lift the mood of those suffering from SAD. The best part is that no drugs are required to achieve some results. So if you find yourself suffering from anxiety, moodiness, have difficulty concentrating, have low energy or fatigue, if you find yourself oversleeping, gaining weight, or having food cravings, check out the ways to beat SAD. These are all possible symptoms of SAD and once you realize what you are facing, the possibility of helping yourself is there. We can stop this seasonal depression or hold it to a minimum if we change our attitudes about the holiday season. Start with an “attitude of gratitude,” being thankful for everything in our lives fills up that space where we would normally feel incomplete. Choose to get along with everyone. When the family gets together and others are ready to pick a fight about something silly, walk away. Do not engage in anything negative. Volunteer some of your time. There are many places that could use another pair of hands or feet ready and willing to do some chores. Maybe there is an elderly person in your neighbourhood who could use a hand with some household chores. Knock on their door and ask, see if you can do something for someone else. It will make you feel really good and lift your spirits. Decide on your priorities. Give yourself enough time to accomplish some of your goals. Bake some cookies (not 50 different kinds), buy or make some gifts (be reasonable), and let yourself take in some of the beauty of the Christmas season. Remember: every Christmas is a new one, they will not be like the ones when you were a child, they will not make disagreements in the past go away, and they will not take away feelings of loneliness, anger, frustration or fear. Christmas is a time to look at each other without getting into disagreements or heated arguments. If there are resentments that are festering, do not add to them. Declare a truce so that you can enjoy the present without bringing up the past……We are all entitled to the way we feel and we can also choose not to share them with others if they are in fact anger provoking. During the Season, find some time to do what you WANT to do. Not what is expected, but what you enjoy. It could be reading a book, taking a walk, going to town to see the lights or some other form of entertainment that you would enjoy. Give yourself permission to enjoy the things that make you joyful. Now all of the symptoms mentioned here are also symptoms of clinical depression. Clinical depression, can also cause many more symptoms that can be very serious. They should be looked after by a professional and hopefully, if you are part of the many people who suffer from depression, you are already under a physicians care. If not, please do not hesitate to go for help. You are not alone, you can reach out for help and no one will turn you away. There are help lines available everywhere and they are there for you. Use them. 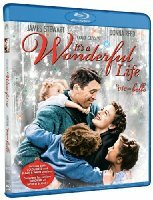 A great movie is “It’s a Wonderful Life”. Rent it or borrow it, watch it and understand that your life, with all it’s bumps and bruises is important and that the things we give and the friends we have are truly the greatest gifts of all. A well said article about an important subject, especially this time of year. Thank you for sharing it. A lot of us aren’t even aware of what causes those feelings. I was thinking just a couple of days ago how much Christmases past affect how I feel about this years. So often memories–good and bad–sneak into our moods. Hope this helps others too.